In addition to book writing and school visiting, Ji-li also dedicates her time and effort in promoting and facilitating cultural exchange between China and West. 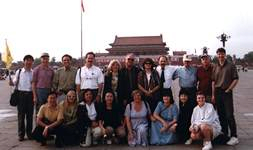 In 1992, she co-founded East West Exchange, Inc , an organization has involved in many exchange programs, including organizing cultural tours to China . In 2003, Ji-li started a nonprofit organization, Cultural Exchange International (CEI) to continue and expand the cultural exchanges she believes in. CEI has involved directly to Children Poverty Relief Project (CPRP ), Kids for Kids , and Summer Camp in China for American students .